Great bracelet! I too put it in between the fish head and tail. I think it looks great there. I love how you've combined it with the two parts of the big fish. Needless to say, that I admire your Emerald too. 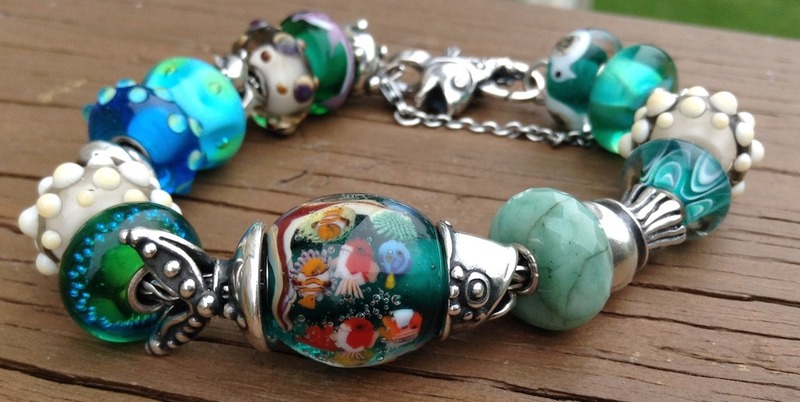 Great idea with the fish bead! Deep ocean looks so much better on real live pictures then on the stock images! Love your bracelet. I think I need the fish bead now. @Nancy wrote: Great bracelet! I too put it in between the fish head and tail. I think it looks great there. One of the shops posted a photo on FB with the fish and I thought it was perfect so had to copy! @Fleur wrote: I love how you've combined it with the two parts of the big fish. My LD ordered several of the deep ocean, but since she is a "standard dealer" she only received two of them before the release date. The rest will be delayed--so I am feeling like the lucky fish since she let me pick first! Both were gorgeous with perfect detail only slightly different sizes. I picked the one that was larger. @Arwen wrote: Love your bracelet. I think I need the fish bead now. @Mabel wrote: Great idea with the fish bead! Deep ocean looks so much better on real live pictures then on the stock images! It is amazing in person. The detail is unbelievable. Lovely with the cream...Nice to see all the beach/ocean silvers again...Jellyfish etc. are some of the best silvers ever I think. Beautiful! Nice to see the new fish lock in action as well. The cream and turquoise combination is very nice. 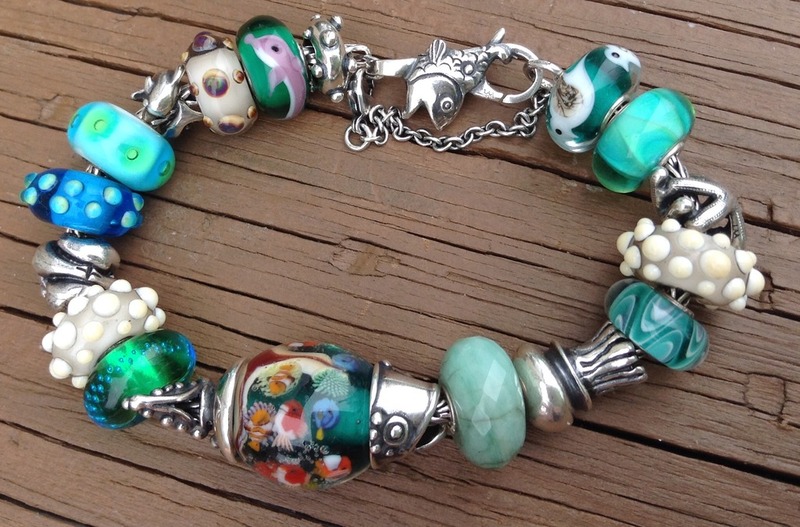 And your dolphin bead is a cutie!